The significantly higher amounts of antiganglionic acetylcholine receptor antibodies in the serum of patients with postural orthostatic tachycardia syndrome (POTS) adds support to the growing understanding of POTS as a possible autoimmune condition, the authors of a new study reported. Researchers have found significantly higher amounts of antiganglionic acetylcholine receptor (gAChR) antibodies in the serum of patients with postural orthostatic tachycardia syndrome (POTS) than healthy controls, according to a paper published online February 28 in Annals of Clinical and Translational Neurology. The findings represent a new step in the growing understanding of POTS as a possible autoimmune condition and could help sharpen and hasten identification of a syndrome that is still frequently misdiagnosed or under-diagnosed. POTS is a disorder of the autonomic nervous system in which patients feel light-headed and dizzy after standing up from a lying-down position, with a fast heartbeat and, frequently, complaints of fatigue, pain, nausea, gastrointestinal problems, and migraine headache. It can be debilitating, but because of the wide-ranging symptoms, physicians may struggle to diagnose it; a POTS diagnosis can take years to establish. In the study, researchers at Kumamoto University in Japan analyzed the serum of 34 patients with POTS, who were a median of 22 years old. They found autoantibodies to gAChR in 10, or 29 percent of them — eight with gAChR-alpha3 antibodies and two with gAChR-beta4 antibodies. Among 19 patients with neurally-mediated syncope, only one tested positive for the antibodies — against gAChR-alpha3. None of the 73 healthy controls who were tested were positive. Researchers also tested 34 patients with other neurological disorders with any autonomic symptoms, and just one patient, who had suspected amyloid neuropathy, tested positive for gAChR antibodies. The seropositive POTS patients were an average of 29 years old, compared with an average age of 20 years old for those who were negative (p=.012). Sixty percent of patients who were seropositive had complications from autoimmune diseases compared to 8 percent in the seronegative group (p< 0.001). Researchers acknowledged that the majority of seropositive patients did not have high levels of the antibodies. Dr. Nakane said that other antibodies — to adrenergic receptors, muscarinic AChR, or other targets — could play a role in at least some of the 61 percent of patients who were seronegative. In the researchers' planned nationwide study, he said, they'll look at gAChR antibodies and treatment outcomes for each subcategory of POTS — neuropathic, hyper-adrenergic, volume dysregulating, and physical reconditioning. A Mayo Clinic case series of 152 patients in 2007 found that one in seven patients tested positive for gAChR antibodies. Other studies since then have found elevated levels of autoantibodies to adrenergic receptors and muscarinic receptors. In 2015, a study of 100 consecutive patients with POTS found that 25 percent were positive for antinuclear antibodies and 31 percent had some type of marker of autoimmunity, both of which were significantly higher than the rate in general population. Svetlana Blitshteyn, MD, director of the Dysautonomia Clinic and clinical assistant professor of neurology at the University of Buffalo School of Medicine and Biomedical Sciences, said that findings on gAChR antibodies in POTS have been tinged with controversy, with some researchers speculating that it may not play a meaningful role. She said it's a “good target antibody,” in part because it's already known to play a role in autoimmune autonomic ganglionopathy (AAG), in which gAChR antibodies are found at higher levels. She noted that the antibodies in this study were found to be more prevalent than in previous studies, and that it could be because a different assay — the luciferase immunoprecipitation system, or LIPS — was used. In the United States, a radioimmunoassay is typically used, and does not test for the beta4 subunit, as LIPS does. Dr. Blitshteyn said a better understanding of the etiology of POTS could lead to better treatment, which is badly needed. Current treatment is mainly non-pharmacologic, often with liberal fluid and salt intake and an exercise program, and off-label pharmacologic therapy, such as vasoconstrictors and beta blockers. But these typically aren't very effective, and the pharmacologic options bring side effects. •. Blitshteyn S. Autoimmune markers and autoimmune disorders in patients with postural tachycardia syndrome (POTS) http://journals.sagepub.com/doi/abs/10.1177/0961203315587566. Lupus 2015; 24(13):1364–1369. •. Thieben MJ, Sandroni P, Sletten DM, et al Postural orthostatic tachycardia syndrome: The Mayo clinic experience http://www.mayoclinicproceedings.org/article/S0025-6196(11)61027-6/fulltext. Mayo Clin Proc 2007; 82(3):308–313. •. Watari M, Nakane S, Mukaino A, et al Autoimmune postural orthostatic tachycardia syndrome https://onlinelibrary.wiley.com/doi/abs/10.1002/acn3.524. Ann Clinic Transl Neurol 2018: Epub 2018 Feb 28. 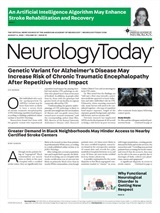 Neurology Today18(7):1,40-45, April 5, 2018. In the Clinic-Migraine Devices: Three FDA Approved Devices for Migraine — How Do Each Compare?